The Tax Cuts and Jobs Act is massive, but here are a few changes that may benefit McDonald’s franchisees. The new 20% Qualified Business Income Deduction (QBI) is one of the biggest tax benefits for small business owners including McDonald’s franchisees in more than 60 years. It’s available to owners of pass-through entities, which is a common businesses structure. For tax years 2018 through 2025, QBI Deduction shelters 20% of their business income from income tax, which is usually taxed at higher ordinary rates. No limit exists to this deduction, but restrictions and certain requirements kick in when a taxpayer’s income rises. The calculation is complicated but worth undertaking to obtain the maximum benefit. Your CPA can determine how much you would qualify for and make suggestions on steps to take to increase your benefit. You can learn more about the new QBI deduction here. Bonus Depreciation: Increased from 50% to 100% and can now be taken for both new and used qualifying property through 2022. The ability to accelerate depreciation on property is especially beneficial for restaurant acquisitions. Section 179 Depreciation: The maximum deduction was increased from $510,000 to $1 million with the phase-out threshold increased from $2.03 million to $2.5 million. Qualified Improvement Property: Is also now eligible for Section 179 expensing. This includes work on roofs, HVAC units, fire protection and security systems, restrooms, tile and lobby work. Read more about equipment depreciation changes here. Tax Reform also increased many individual tax benefits, as well. The maximum tax rate has dropped from 39.6% in 2017 down to 37% in 2018. In addition, most of the tax rates have declined by an average of 2%. In addition to the decline in tax rates under the new law, a married filing jointly couple will not reach the highest tax bracket of 37% until their taxable income exceeds $600,000. This is up $120,000 over the 2017 threshold amounts. Thus, more of your income will be taxed at lower rates. The new law doubles the lifetime estate and gift tax exclusion. It increases the exclusion to $11 million per individual or $22 million per married couple. At $22 million per married couple, this could provide significant benefits. The annual gift tax exclusion increased from $14,000 to $15,000 annually starting in 2018. Read more on the individual changes here and the estate changes here. 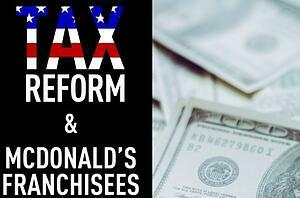 You can learn more about the changes will affect McDonald’s Owner/Operators in our webinar “Tax Reform & McDonald’s Franchisees.” Email us at info@concannonmiller.com for a copy. There are a lot of new benefits McDonald’s franchisees can take advantage of in the Tax Cuts and Jobs Act, but there’s also a lot to analyze, especially with the QBI deduction and increased depreciation options. Concannon Miller runs multiple planning scenarios to help McDonald’s Owner/Operators navigate the new tax law. Please contact us at info@concannonmiller.com to get a complimentary assessment for your business.